Intimate neighborhood wine bar near the Avenue of the Arts. 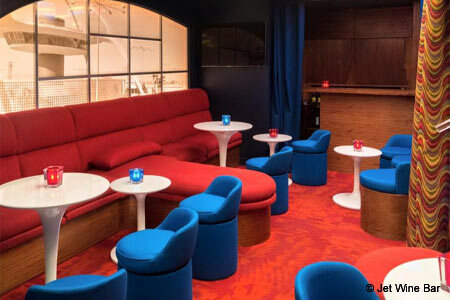 : If you're looking for an affordable spot for before or after a performance on the Avenue of the Arts, you should put Jet Wine Bar on your radar. This shoebox-size space is located on a happening block of South Street that includes the old school shot-and-beer joint Bob and Barbara's and newer pubs such as The Cambridge. Owner Jill Weber has assembled a list of nearly 30 wines by the glass that match well with the menu of globally-inspired small plates. Deviled eggs balanced their creaminess with the heat of paprika topping, while the Spanish meatballs in a light tomato-thyme sauce satisfied without being too heavy. Bruschetta, a house specialty that can be mixed and matched, comes in combinations such as spinach, goat cheese and tomato; pear, onion and Gorgonzola; and kalamata tapenade. Everything washes down nicely with the house Montepulciano d’Abruzzo, a good value at $6 a glass. Weekend brunch offers such dishes as french toast du jour, savory mushroom and bread pudding, and hanger steak salad, as well as a selection of sparkling cocktails and a sriracha and lime Bloody Mary.